The colours of the flag are the colors of the coat of arms. Seven stripes: blue, yellow, green, yellow, green, yellow, blue. The flag and coat of arms were adopted on 25th June 1995. 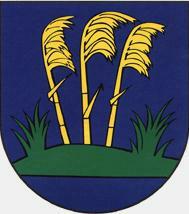 Gabčíkovo, originally Beš (Hungarian: Bes) has 4910 inhabitants (94.0% Hungarian, 1990 census). It was first mentioned in 1248. Here is the Gabčíkovo Dam in the Danube. Bős has got its Czechoslovakian name after Jozef Gabčík (1912-1942, who was one of the killers of R. Heydrich in Prague in 1942) - but the commonly used name is Bős.